Welcome to the "Pure Fishing Page"
"The Fort" has been involved in the fishing world since 1969. The roots of the FORT started with a fishermans village of campers over the entire property. What a great place to be with all the walleyes and white bass passing by us to get to the spawning areas upriver. Flash forward 40 years. Even though the face of the FORT has changed, the roots remain imbedded deep. We are a diversified business supplying waterskiers and boaters alike. Even though we are no longer a fishermans village, it does not mean that we do not know the fisherman. April we will host our Walleye Classic Walleye Tournament, and 2018 will mark our 17th year of the event. With the focus on the family we have many fathers and sons and brothers fish the event. It has become one of the most popular tournaments on the whole winnebago system. You can find past champions listed below. Several of our employees here at "The Fort" fish at some point every day during the spring season. Whether its off the docks or in their boats, before and after work and sometimes all night on the raft, they're out there fishing. They are die-hards! Using their experiences and listening to the river "Chatter" we will help to direct you to the fish. 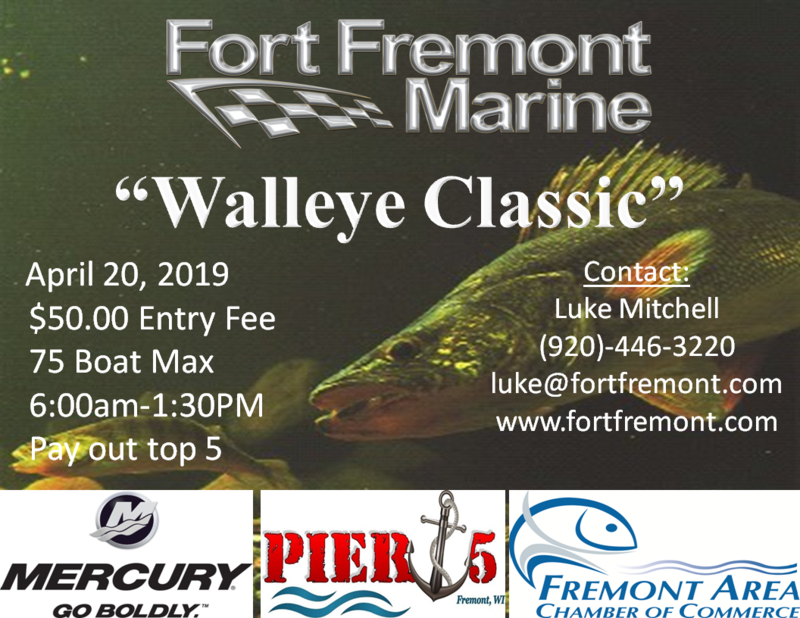 Sponsors of the event include, Mercury Marine, Ma's Bait, Fremont Bait and Tackle, Chico's Landing, Pier 5, Nauti Turtle , Fremont Chamber of Commerce, and Fort Fremont Marine.